TV news coverage reveals a similar trend. 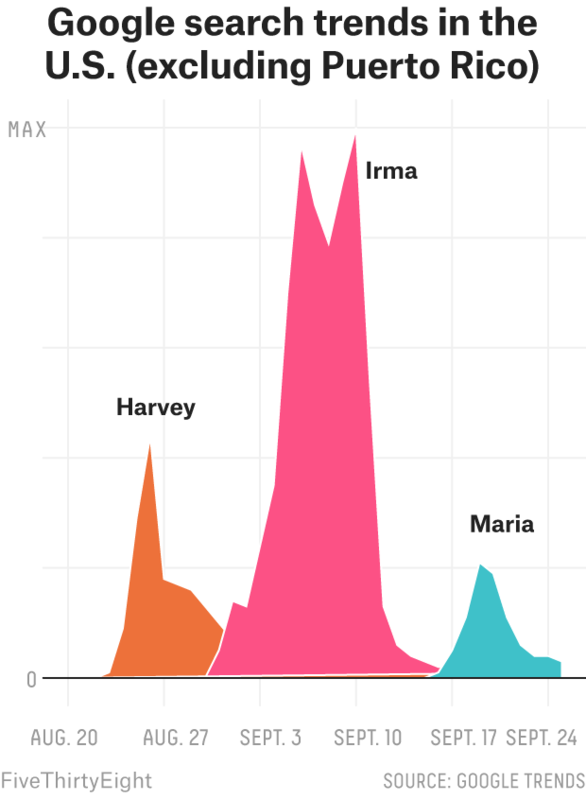 Data we collected from the TV News Archive shows that people on TV news shows spoke significantly fewer sentences about Hurricane Maria than about Hurricanes Harvey and Irma.2 The spike in conversation about Puerto Rico right as the hurricane hit was also much smaller than the spike in mentions of Texas and Florida on television as each of those states was hit by a hurricane. Of the cable news networks that covered Hurricane Maria, the BBC, a British network, initially mentioned Hurricane Maria on air more than the U.S. networks did. 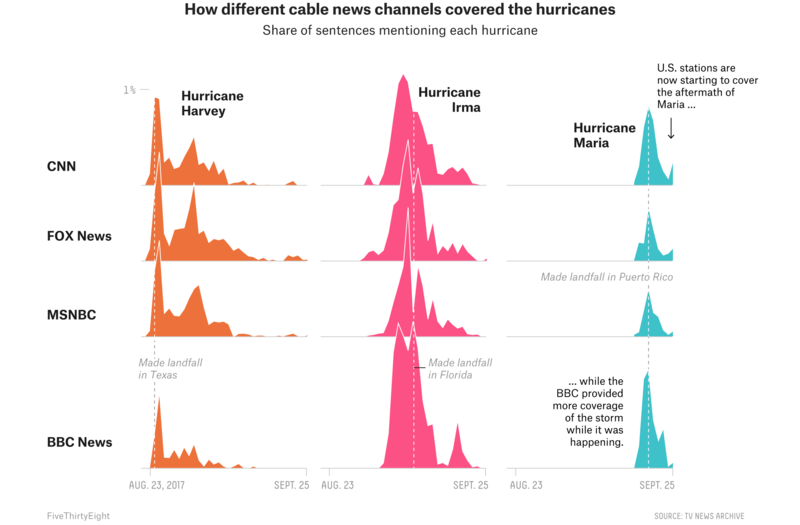 CNN seems to have aired more coverage of Maria than its competitors in the U.S. did, and the data hints that the network may again be ramping up its coverage. We're calling on national/local media to cover devastation in PR w/ equal attention & responsibility that would be given anywhere in U.S. But it is not just the media that isn’t paying attention. A recent poll showed that less than half of Americans are even aware that Puerto Ricans are American citizens. Google searches from the rest of the U.S. show that public interest was also higher for the two storms that hit the mainland than it was for the storm that hit Puerto Rico. After his initial silence on the issue, President Trump has a visit to Puerto Rico planned in the coming week. Perhaps his presence will bring more media and citizen engagement from the mainland. We used their “U.S. Top Online News” collection, which looks at 49 top online news sources as of 2015 according to Pew/Comscore. This includes newspapers like The New York Times and digital-native sites like Vox. We used the Television Explorer tool which produces analysis by the GDELT Project using data from the Internet Archive Television News Archive.